Before I became a UX designer, I was studying and working in the world of animation. Animators use storyboards as a planning tool because it’s very expensive to change animated content after it’s in progress. I latched onto storyboarding because it allowed me to explore many story options for characters with different perspectives, across different situations, before jumping into the details of rendering an animation. 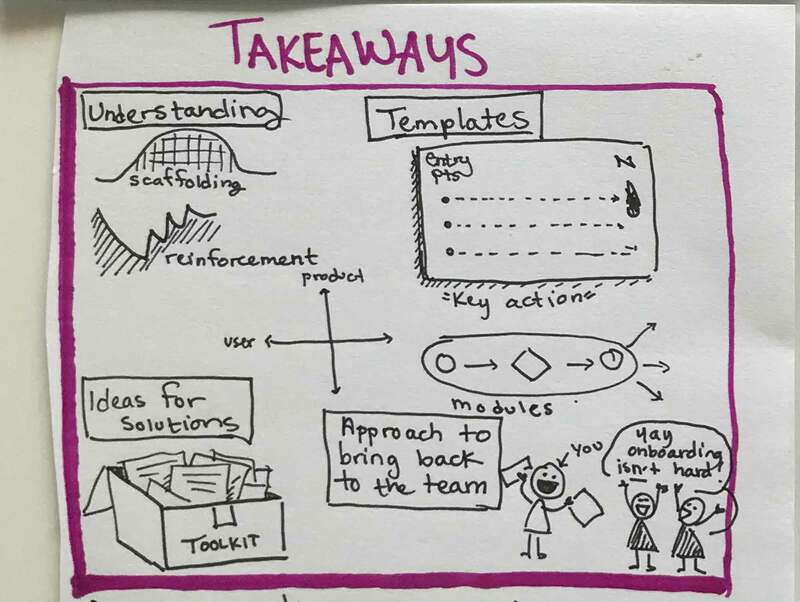 Storyboarding came with me as I became more involved in UX design. As a technique, it helped me articulate to my teams the people, environments, and situations that surrounded our products, helping us envision better solutions that fit into the lives of our users, or helped us create realistic go-to-market strategies. And I’m certainly not the only UX designer who has recognized the importance of storyboarding. AirBnB popularized it as a UX design tool with their Snow White project, in which the company developed storyboards from the host, guest, and hiring perspectives to rally the team around a clear vision for their service. A workshop is a service, and I’ve found storyboarding to be a natural fit for planning one. While outlines are good for structuring content, workshops are extremely multimodal and I need more than an outline to help me envision how people will consume and work with that content. I start by illustrating the first frame and final frame of the workshop. What does the end-result of the workshop look like for attendees? What artifacts do they generate, and what kinds of things are they thinking or saying afterwards? Then: what does it look like when they begin? Do they start with a blank slate? Do they have or need knowledge before they start, such as prework? Visualizing the delta between the beginning and outcome of a workshop helps me plan exercises that can bridge that gap, or, if I am designing a workshop to fill a fixed time, helps me adjust the desired outcome to be reasonable for the time allotted. This is a panel I created to show what I wanted participants to take away from a workshop, including tangible artifacts as well as confidence and concepts. I pinned this to the wall while sketching out other parts of the storyboard. In many cases, you will have content that already exists before you create a workshop for it. Maybe it’s from writings you’ve done, or from presentations you’ve given. Translating that content into something not just presented, but participated in, takes something more than just a written outline. In user onboarding design I talk about finding your product’s coaching cadence: the right balance between guiding users and engaging them in pure discovery. The same principle applies in workshop design because you need to impart concepts and also have people put concepts into practice. Storyboarding allows me to visualize scenes where I’m presenting against scenes where people are working; I can then act this out on my own (or with a willing friend!) to get a sense if it feels too heavy or too light. To remind myself that I’d have to be giving instructions on screen while participants at a table worked through an exercise, I included a frame in the lower right corner of each panel that showed participants engaging in the activity. I’ve attended a few workshops where the presenter has walked into the room and been surprised by the layout, then has everyone spend the first 10 minutes moving things around. Sometimes, we become so engrossed in content planning that we forget to plan for the environment. While it’s not always possible to get the room layout you want (we live in the real world, after all!) 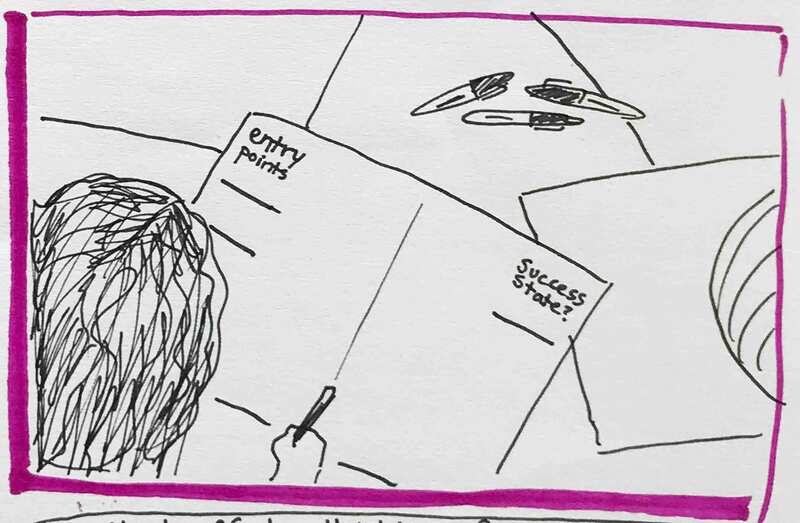 storyboarding can help you visualize your ideal layout. This can help you have a conversation with event planners or facility folks, and you can negotiate to something that serves both sides. If you can’t change the room layout, drawing it into your storyboards helps you plan how to best arrange activities around it. These sketches show participants in groups of 4 at dedicated, round tables. I shared this ideal with one event organizer who let me know that we’d have 8 people per table. This early notice allowed me to plan for dividing the people at those tables in half to create groups of 4. How you want a workshop environment laid out is one assumption storyboarding can reveal. There are many others worth identifying early to avoid last-minute surprises. Did you assume one activity would be simple, but it’s taking multiple panels to sketch out now that you’re visualizing real people doing it? If so, you’ll likely need to break it down into more manageable chunks. Storyboarding can also reveal assumptions you have about your audience. Are you sketching participants with laptops? What if they don’t bring laptops? 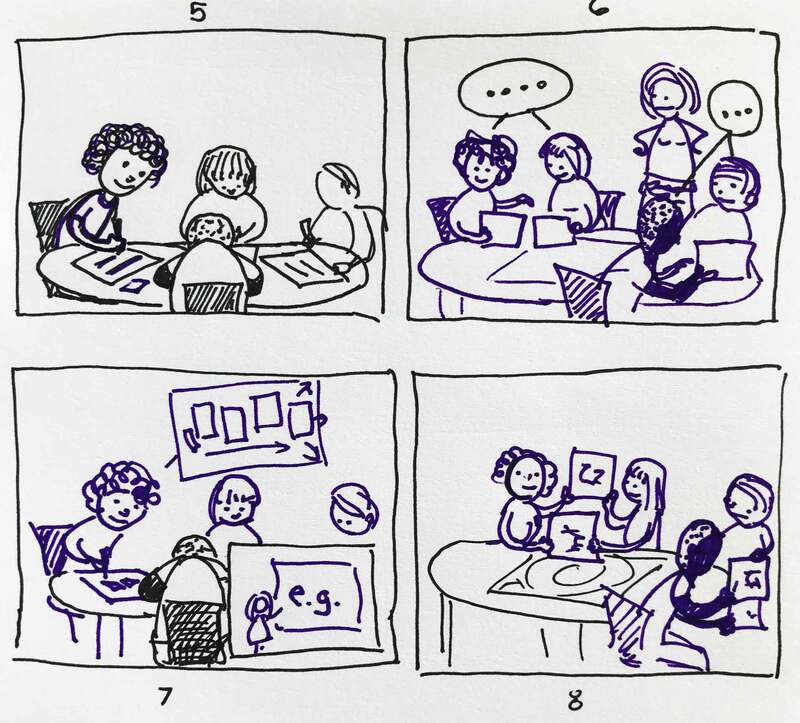 When you look at the sketches of your workshop activities, does it look like they’ll accommodate participants with assistive needs? Are all of your illustrated conversations between participants happening in English? What if someone doesn’t speak English? In these early panels, we can already see that I had assumptions about having a lot of wall space, and a very large screen at the front of the room. You may not be able to address everything, but being aware of assumptions can prepare you for potential issues that may arise much earlier in your design process. Having a list of assumptions can also help you create a supply list. Do you need sharpies and pens? Do you need a stack of paper handy? Outlets at tables? Planning all the bits and bobs you need early on will make your life, or the lives of event organizers, so much easier. This panel helped me identify that I’d need some pre-printed templates and, of course, lots of markers. Storyboarding doesn’t replace doing a test run. But it can make those test runs more effective. Workshops can easily stretch into the 3-6 hour range. If you find people willing to volunteer that much time, you don’t want to waste it. 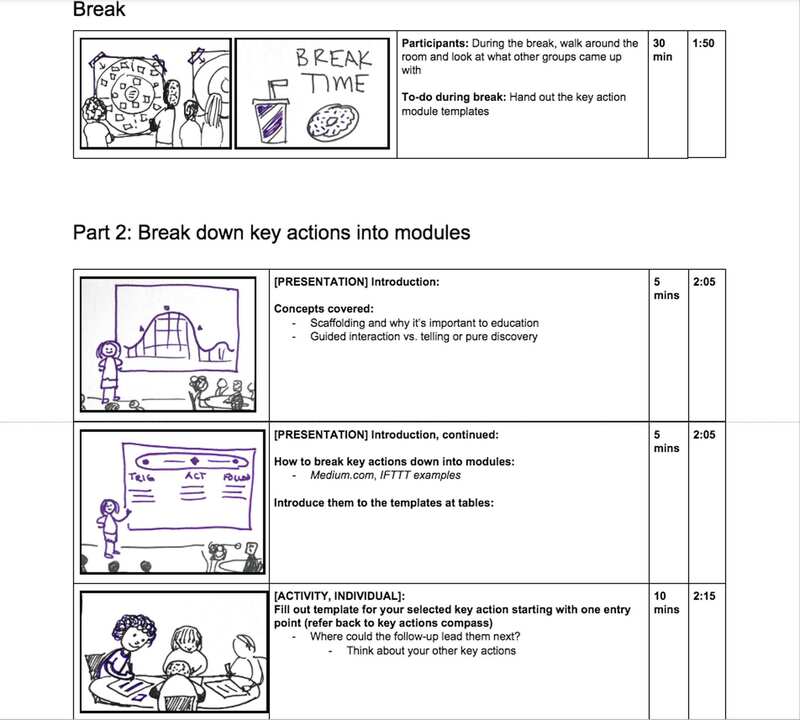 Storyboarding helps you make baseline decisions about content choreography, room layout, and other logistics before subjecting real humans to your curriculum. Your volunteers will find it easier to give feedback on something concrete, and you can focus on improving timings, understandability, and other aspects that only real humans can reveal. 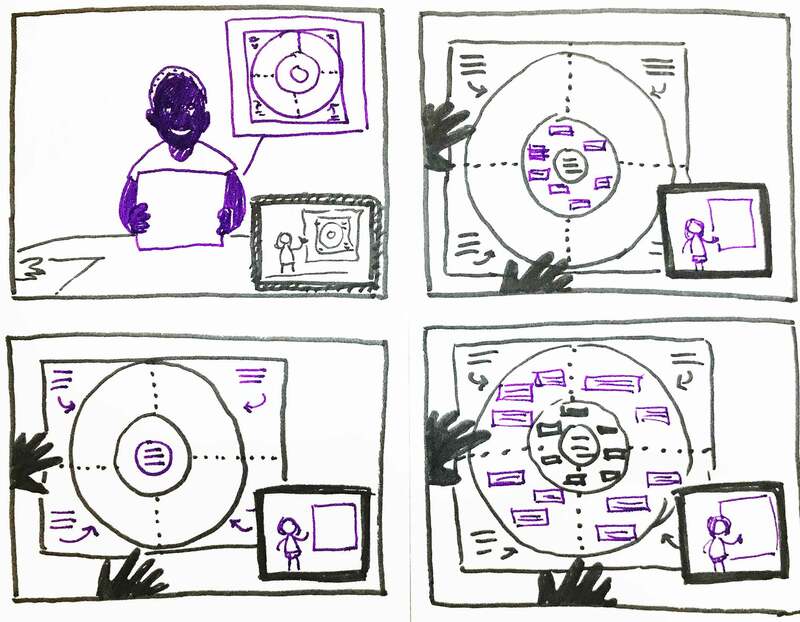 The following is a snapshot of how I created and used storyboards in my recent workshop. I create an outline first, usually in a Google Doc. I don’t go into too much detail, but it is a good way to arrange content pieces and activity ideas into logical sections. If I’m doing a workshop for an organizer that has structural requirements (e.g., that there needs to be a break at a specific time, or that things need to be broken down into 4 sections), this is where I figure out how to work around them. Using the outline as a starting point, I start sketching panels using either pen and paper or in the Procreate iPad app. As mentioned previously, I start with a sketch of the workshop’s end state. What do participants ideally think or say afterwards, and what are the physical takeaways? I pin up that panel as I do the rest of my sketching. This is similar to an approach I encourage for creating user onboarding experiences with long-term impact: to design guidance by starting at the end and designing back toward the beginning, so that everything we build is in service of an end goal. Workshop storyboarding is best done in the same way. 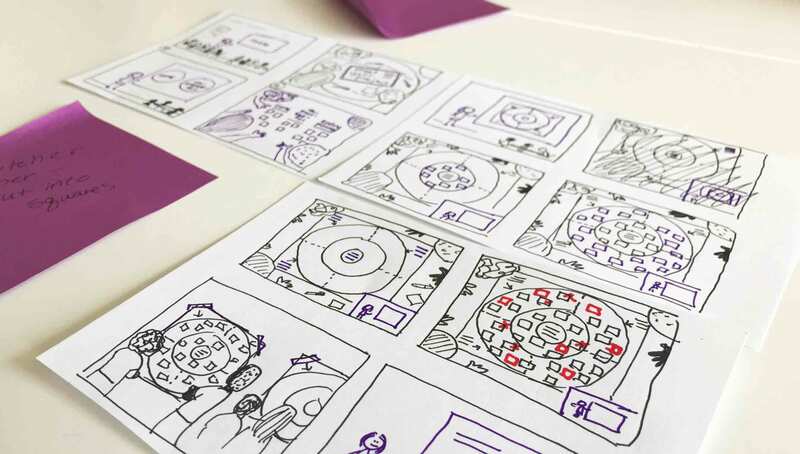 After creating an outline and a sketch of workshop outcomes, the storyboarding process gets into full swing with lots and lots of sketches using whatever paper or app is available. After sketching (and re-sketching! ), I take photos of or export my storyboard panels, and combine them with my outline in a new Google Doc. I create a table row for each storyboard panel and break it into 4 columns. The first column is for the image of the storyboard panel, the second column contains details about concepts being taught and activity instructions, the third column tracks how much time that panel might take, and the fourth column tracks the total time elapsed through the workshop up to that point. I photographed each storyboard panel and dropped it into a Google Doc, where I merged my outline and storyboard together. This gets the storyboard into an actionable, and shareable, form. If an organizer is having trouble visualizing a particular room layout I’ve requested, for example, I can show them a snippet from this storyboard-outline for context. The storyboard artwork rarely changes after I start in on decks or assets, but I print it out and use it to keep track of my timing. I’ll also remove rows, or move them around, as I do test runs and find that I need to reorder content. 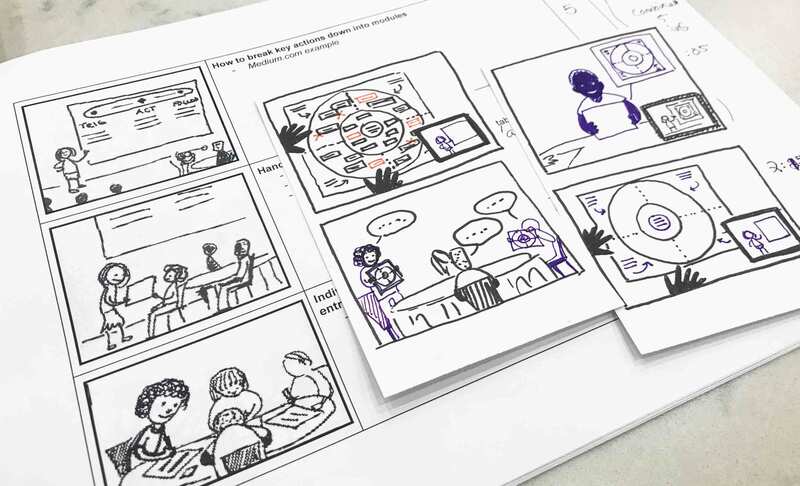 If you’re someone who is comfortable with sketching, storyboards are a great planning tool for workshops. They help you visualize the contexts surrounding your participants, manage surprises, work better with event organizers, and, most importantly, cut down on iterations of content in the final stages of design. Give it a whirl, and let me know what you think!